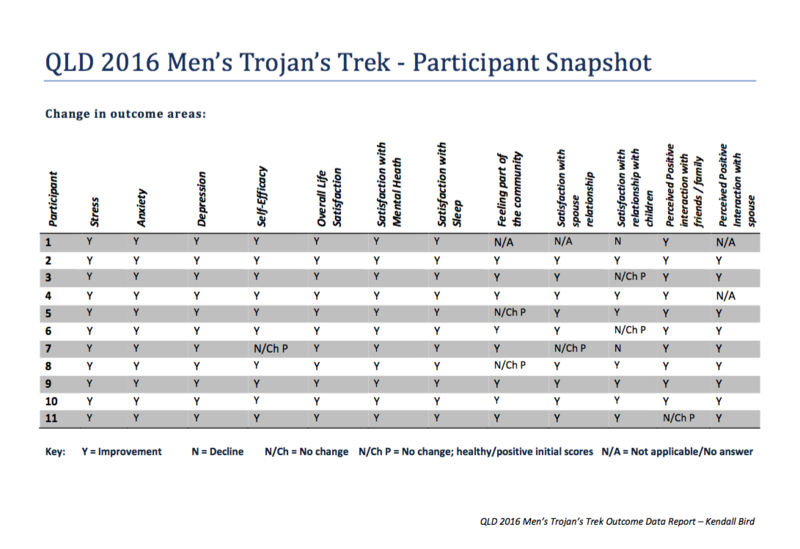 There were eleven participates in the 2016 QLD Men’s Trojan’s Trek. For the purpose of this report, their questionnaire responses on four measures (Depression Anxiety and Stress Scale -DASS21, General Self- Efficacy Scale, Life Satisfaction Scale and the Positive and Negative Interactions Scale, See Table 1) were scored and analysed to measure quantitative change in mental health and wellbeing indicators from Day 1 and Day 6. 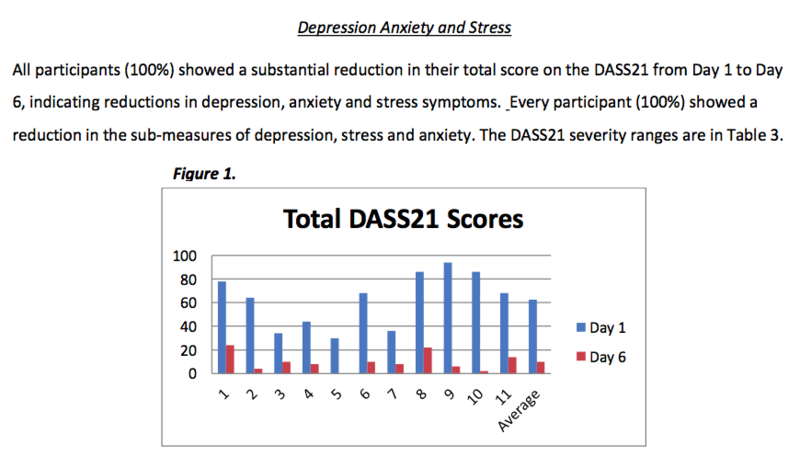 All of the participants (100%) showed a positive change between Day 1 and Day 6 on their total DASS21 scores (reduction in scores for depression, anxiety and stress). All but one participant showed an increase in self-efficacy. Overall life satisfaction improved for all participants, and all showed an increase in satisfaction with mental health and sleep. Nine of the eleven participants (82%) showed an increase in satisfaction with feeling part of the community; the other three participants’ results remained stable. Ten of the eleven participants showed an increase in perception of positive interactions with friends and family, and increase in positive perception of spouse relationships was seen for all participants in a relationship. Satisfaction with relationships with children improved for seven of the eleven participants, while two remained stable. Results for each measure are outlined below in greater detail. Of note, five participants showed clinically significant reduction in all areas measured: stress, anxiety and depression severity. A sixth person showed significant reduction in stress severity, and another showed reduction in depression to clinical levels and another two participants showed significant reductions in both depression and stress, as highlighted in Table 2. On average, participant scores changed from severe anxiety, stress and depression on Day 1, to normal level anxiety, stress and depression scores by Day 6. At Day 1 scores were well above the average for the general population and by Day 6 became well below the average, see Table 3. As outlined in Figure 2, ten participants showed an increase in their self-efficacy scores and one participants’ scores remained stable. 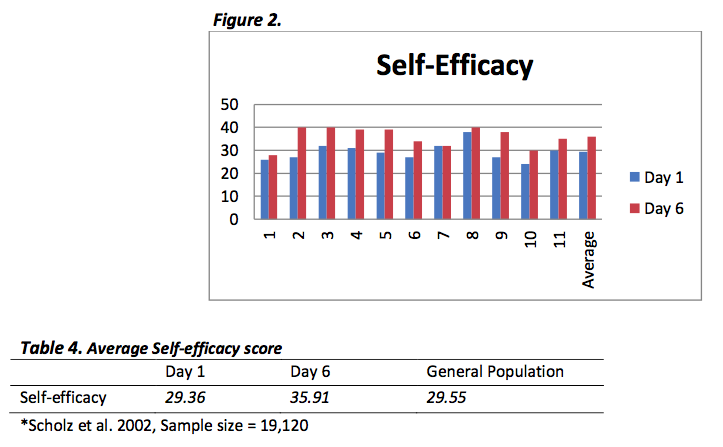 The average self-efficacy score was similar to that of the general population at Day 1, and above the general population at Day 6, see Table 4. 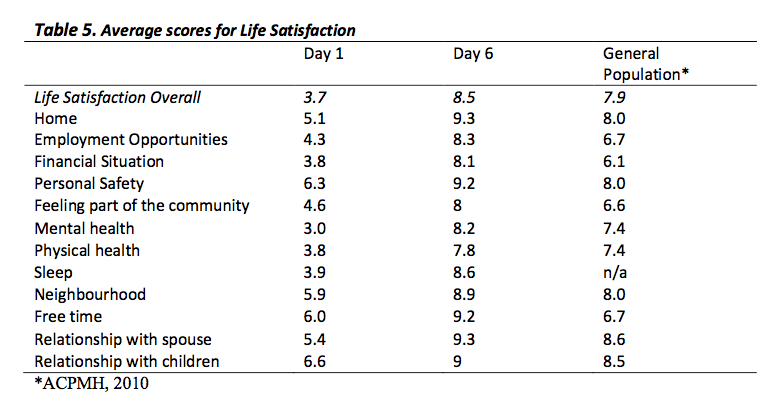 ￼￼￼￼￼￼￼￼￼￼Overall satisfaction with life increased from Day 1 to Day 6 for all participants, and satisfaction increased in all areas measured; see Table 5. Participants’ life satisfaction in all areas was below that of the general population at Day 1, and above that of the general population at Day 6. Selected results for life satisfaction are shown in Figure 3; ten participants experienced an increase in overall life satisfaction between Day 1 and Day 6, nine participants showed an increase in satisfaction with mental health, and ten showed an increase in feeling part of the community and increased satisfaction with sleep. On average, perception of positive interactions with friends, family and spouses increased between Day 1 and Day 6. This scale (the Positive and Negative Interactions Scale) measures participants’ perception of how well they feel their relationships are going. Taking results from the Life Satisfaction Questionnaires, all participants who had a spouse indicated improvement with their satisfaction with their relationship except for one participant whose scores remained high and stable. Seven participants showed improvement in satisfaction with their relationship with their children, with two participant’s scores remaining stable and two others showing a slight score reduction, see Figure 4. DASS21: Lovibond, S. & Lovibond, P. (2004). 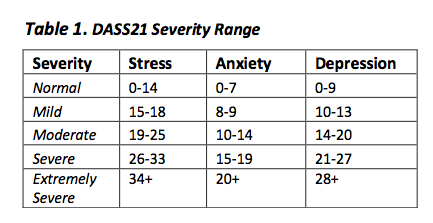 Manual for the Depression Anxiety Stress Scales (2nd Ed). University of New South Wales: Sydney. Positive and Negative Interactions Scale: Schuster T. L., Kessler, R.C., & Aseltine, R. H. Jr (1990). Supportive interactions, negative interactions and depressed mood. American Journal of Community Psychology, 18, 423-438. Self-Efficacy Scale: Schwarzer, R., & Jerusalem, M. (1995). Generalized Self-Efficacy scale. In J. Weinman, S. Wright, & M. Johnston. Measures in health psychology: A user’s portfolio. Causal and control beliefs. 35- 37. Windsor, England: NFER-NELSON. 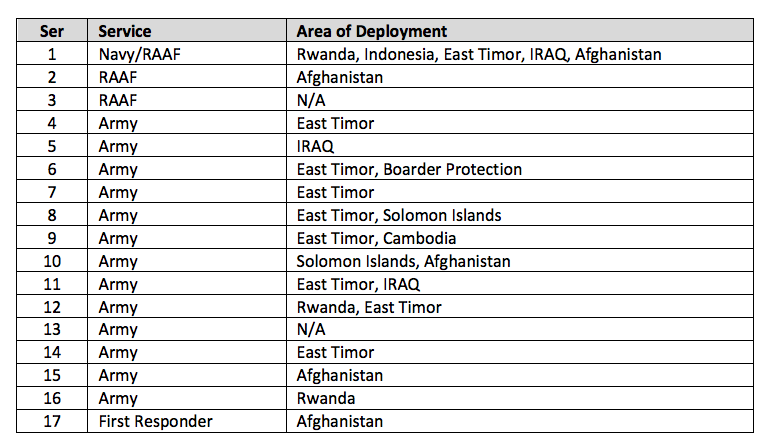 Note: See Participant Snapshot for an overview of where areas of change were for each participant.